A Windows system with at least 2048 MBytes of RAM. To install SMPPCli, create a directory, extract SMPPCli.zip to that directory. To uninstall SMPPCli, simply remove the installation directory. Create SMPPCli.ini in the installation directory. 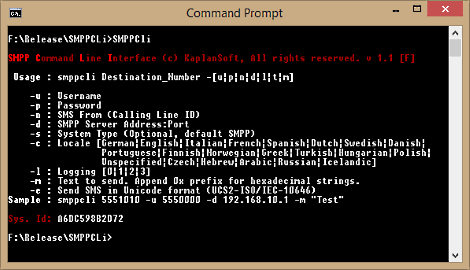 You can place SMPPCli.ini to a directory which is in search path of your environment. Run SMPPcli from command line with the destination number (C:\SMPPCli>smppcli 02135551122 -u 02125551010 -d testserver.com:2775 -m "This is a test message").
' Specify SMPP Server address and optionally TCP port. Default port is 2776.
' Specify password. Default is blank. C:\SMPPCli>smppcli 02135551122 -u 02125551010 -d testserver.com:2775 -m "This is a test message"
Sample : C:\Program Files\sipcli 02135551122 -u 5551010 -m "This is a test message"
Freeware version supports maximum 10 characters in an SMS.